After recovering from an early move to the downside, stocks moved mostly higher over the course of the trading session on Friday with the Dow climbing 200 points to 25,538. Looking ahead, following the positive outcome of the meeting between the presidents of the US and China, optimism on Wall Street is likely to drive trading this week, while the monthly jobs report will be in focus toward the end of the week. Traders are also likely to keep an eye on Congressional testimony by Federal Reserve Chairman Jerome Powell as well as reports on manufacturing PMIs and factory orders. After trading lower early in the session, the Dow ended the day higher on Friday forming a bullish engulfing candle followed by a white candle formed in early Asian hours trading which will likely set a positive tone for the rest of today's trading session. The stock index shows strength in the short-term supported by its long-term uptrend. 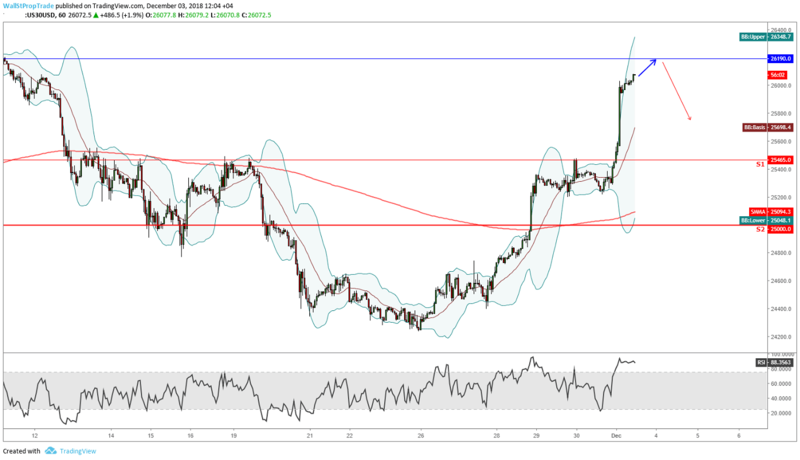 However, prices are trading close to the key technical resistance level at 26190 which is likely to offer the opportunity for some profit taking. Additionally, the RSI is indicating extreme overbought conditions suggesting selling pressure ahead.